Steven James, author of the Patrick Bowers series, has written a book that takes the reader on a journey throughout the entire Bible from Eden to eternity. 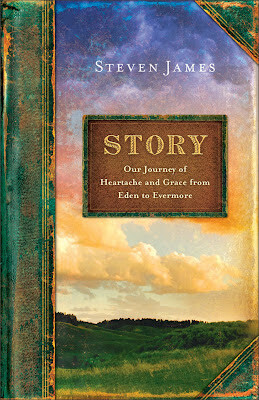 "Story: Our Journey of Heartache and Grace from Eden to Evermore," is a book to really take your time reading and working through as there is so much on each page and so much to be gained even if you are familiar with the Bible and the stories included in it. "Story" includes some of the more common well-known Bible stories; however there are chapters devoted to lesser known details contained throughout the story and there is so much included in each of the chapters. James really pulls the reader into the story with the poetic style of writing, the details and the emotion that is included. I feel like I learned a lot from reading this and I often stopped and went back and reread a paragraph as it was a lot to take in in just one reading or I would be interrupted and have to/want to go back. I think this book would be a great one to use with a small group as it would lead to great discussions. I recommend this book for anyone wanting to gain a new perspective or learn something new or just want to spend more time in God's Word. "Almost Amish" is the first novel I have read by Kathryn Cushman and this will not be my last! I loved this book! Julie has a good life, but she feels as if she is not really accomplishing anything and she feels like she cannot take life as it is anymore. Susan is desperate to prove that she can be successful and make it on her own with her daughter since her husband chose to have another life. This includes being a part of a reality television series as this is the thing that is needed to launch her cookbook. Susan, Julie and their children leave their comfortable, busy and stress filled lives in California for a summer in Tennessee living "almost Amish;" is this life really more simple? I loved the whole idea of this story - modern, busy families, normal families taking a break from real life to prove a point, but really they each end up learning about themselves and others. The characters are so real and well-developed in this book as well. The relationships between the mothers and their children, especially Susan and Angie is very real as well and the characters and emotions are really brought to live. Gary is a lovable character and I enjoyed reading about him and the role that he plays throughout the story. This is a quick read that pulls you right into the story; however it is also thought-provoking and even now after finishing the book, I'm still thinking about it and my own life. "The First Gardener," written by Denise Hildreth Jones is one of the most emotional, heart-wrenching novels I have read, but it is also one you do not want to miss out on! Gary and Mackenzie are the first family of Tennesee and are preparing for their only child to begin school and then tradegy strikes and it is more than Mackenzie can handle. Seeking strength from God and others around her is the only way that she is going to make it through this time. However, help comes from unexpected people in her midst. Jeremiah is the gardener and has been at the Govenor's mansion for a long time, yet he is drawn to this family during their time of personal need and he has more gifts than just tending the mansion gardens. This is such a well-written book and one that will have you completely engrossed in the story and the characters' lives. The characters are well-developed and come alive on the pages. I found myself crying with Mackenzie and laughing along side Eugenia and wishing I had a gardener to work along beside like Jeremiah not only for his landscaping expertise, but his wisdom for the heart as well. This is a very emotional read and one that will not soon be forgotten. Bruce W. Martin has written a book that is sure to uplift and help anyone who is going through a difficult time as many are on a daily basis. "Desperate for Hope: Hanging on and Finding god during Life's Hardest Times" takes the reader on a four part journey to work through and move on in life after a difficult time. Life can change in a split second and be forever changed, whether is be from an accident, a decision to divorce a spouse, a diagnosis given by a doctor or a job that is lost. Whatever it may be, life will never be exactly the same and many will question why did this happen and how will I ever get through this. Martin is here to not sugar-coat things, but to help the reader work through a difficult time and really seek and rely on God during these times. Split into four main sections, this book is written in a style that is easy to read as it is divided into well-defined chapters and also it as if Martin is speaking with you, not at you. There are reflection/your story questions that are included throughout as well really making this book one that is geared for the reader. This book is an excellent resource to go to in a time of need and encouragement. it is easy to read and yet it is thought-provoking. Different Biblical promises, examples and stories are included throughout the book as well as the author's personal experiences. Also, I think that the author does a great job at explaining different verses and passages in everyday language that is easily read and understood. I see this book being a great resource for many needing encouragement. "Dying to Read" is book 1 in Lorena McCourtney's The Cate Kinkaid files series and this is a book that you do not want to miss! This book is the first that I have read by this author and I am going to check out her other series as well! Cate needs a job, so she takes the one that is available, working for her PI uncle. Cate has no experience and she is promised that her assignment is simple. However, what turns out to just be a routine address verification turns into an investigation of a mysterious deaths with several possible suspects, a missing young woman, and a man who claims to be an uncle, but is really a former boyfriend and a look-alike whom Cate wants to trust, but is confused by the stories she tells. When Cate's uncle is in the hospital, Cate finds herself trying to solve this mystery and yet she finds herself in some crazy situations and also in possession of a cat whom has an uncanny ability. To add more on Cate's plate, she must decide whether to meet up with her ex-fiance and also how must to trust a new man in her life. This is a great book! It is a mystery that will keep the reader guessing, but it is funny as well and I just loved the characters! McCourtney brings the characters and the settings alive with her details and descriptions. I loved the book club ladies and Cate's experiences with them; I was able to get a really get I am looking forward to book 2 coming out in this series and spending more time with Cate and Mitch! Book Review - "52 Little Lessons from It's a Wonderful Life"
Bob Welch has complied 52 lessons from the famous movie that is watched and loved by many families each Christmas in his book, "52 Little Lessons from It's a Wonderful Life." This is a must-have for anyone whom enjoys this movie and for anyone needing a reminder that each person is special and is of used of God. I love Christmas and everything related to Christmas; therefore I was so excited to get a chance to review this book! This is such a great collection of "lessons" and reminders not just for during the Christmas season, but for every day of the year! This is a perfect gift for fans of the movie, "It's A Wonderful Life." After reading this book, you will have a smile on your face and you will feel ready to tackle life's challenges and have a more positive outlook about everything and you will want to watch this Christmas classic! Win a Kindle Fire or Nook Color from @SuzanneWFisher in "The Haven" Giveaway! RSVP for Live Video Chat on 8/30! Celebrate the newest book in the Stoney Ridge Seasons series with Suzanne by entering her 4 eReader Giveaway and Facebook Party and RSVPing for the Live Video Chat on 8/30! Suzanne Woods Fisher's second book in her Stoney Ridge Seasons, "The Haven," is one that you do not want to miss out on! I loved this book and returning to the Lapp family! Sadie has returned home from spending time with her sister Julia; however Sadie brings home a baby and thanks to MK, rumors are flying around about Sadie and the baby. Gideon even believes this rumors much to Sadie's dismay; however this may be just the thing that Sadie needed as it makes her question if he is the one for her. Sadie is staying busy with caring for the baby and also her remedies as her calling seems to be healing. However, she finds herself drawn to Will, an Englisher, whom is staying on their land and watching the endangered birds and also helping around the farm. Will is like no one she has ever met. Sadie and Will are both at points in their lives of finding themselves and being comfortable with who they are as individuals. This is such a well-written book and has so much to it, so many issues are addressed by Fisher which I have noticed in her books and love about them. I cannot wait until the next book in the series comes out as this one leaves the reader hanging and wondering how things end up. I have thoroughly enjoyed Mary Connealy's triology of The Kincaid Brides and book 3 may be my favorite of the three books in this series! "Over The Edge" is filled with so much - great characters whom are full of life, love and people you would love to meet, drama, romance, and secrets. This book begins with excitement as Callie is on a stagecoach with her eight month-old son heading out to the ranch owned by her son's father's family. However, a stagecoach robbery is attempted and Callie finds herself shooting at the outlaws and sending her son wtih the other couple on board to go get help and to stay safe. This is just the beginning of this book and I was immediately hooked on the book! This is a triology that must be read in order as the books go in sequence, but also you do not want to miss out on a second of the characters' lives! The Kincaid brothers and their brides are all characters whom have been well-developed in this trilogy and they are characters I have enjoyed reading about. Seth cannot remember being married and Callie is fiesty enough that she has a hard time believing that and is ready to kill him. Seth and Callie must work through this along with the fact that they are married and have a child together along with dealing with past issues. This is a highly recommended book and series! 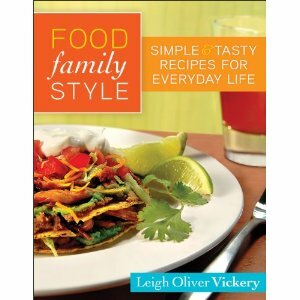 "Food Family Style: Simple & Tasty Recipes for Everyday Life," by Leigh Oliver Vickery, is a great new cookbook that every family needs in their kitchen! This book is filled with a good variety of easy, kid and family friendly recipes that are healthy, filling and delicious as well! Leigh Oliver Vickery is the founder of a speciality food company, blogs at www.onebighappytable.com and is the founder of the Queso that is served at the Dallas Cowboys' stadium! I made a recipe last night from this book that was so easy and delcious! Preheat oven to 350. Spray a shallow square casserole dish or pie plate with nonstick cooking spray. Pour 1 cup sugar and flour into a mixing bowl. Add milk and whisk well. Pour batter into prepared baking dish. Sprinkle fruit over batter, distributing evenly. Sprinkle remaining 1/4 cup sugar over the top. Bake for 1 hour, until golden brown and bubbly. Serve warm with vanilla ice cream, if desired. This recipe was very easy to make! My four year-old daughter loves to help in the kitchen and this was something she could make with me, so that is an added plus for the recipe as well! I used 2 cups of sliced peaches, but I am sure a mix of the three fruits would be delicious as well! Also, don't be turned off from the recipe if you do not have self-rising flour; to substitute use 1 cup all-purpose flour, minus 2 teaspoons then stir in 1 1/2 teaspoons baking powder and 1/2 teaspoon salt. 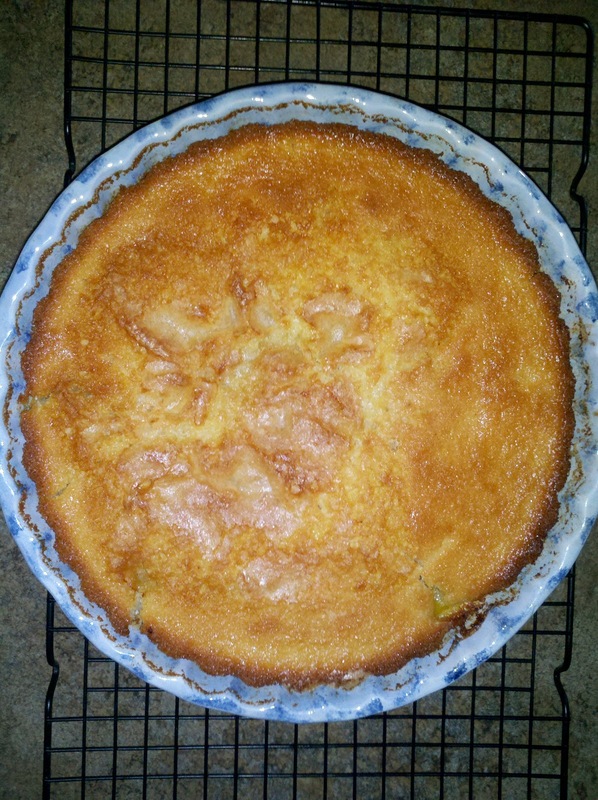 My husband ate this cobbler with vanilla ice cream and enjoyed it, while I ate it plain and enjoyed it as well, so bake a pan and enjoy either way! breakfast, soups and salads and desserts just to name a few. There are also menus included for various occasions, a substitution guide for healthier eating and basic must-haves for the kitchen. This cookbook does not include any pictures of the food, it just contains the recipes. However, do not let that keep you from trying this book, you will not be disappointed! I have a whole list of recipes that I must try including Chicken Stuffed Shells, Slow Cooker Chocolate Lava Cake, Pecan Pie Muffins, Buffalo Chicken Pizza, and Grilled Apple Cheddar Sandwich; don't these all sound delicious?! Janice Cantore, a retired police officer, shares her experiences and knowledge and brings to life her characters in her Pacific Coast Justice Series. Book 1, "Accused," will pull you right into the midst of action and have you reading page after page as it is high-energy, full of drama - both on the job and in the character's personal lives, and real-life action. Carly is not pleased with having to work in the juvenile department; however one case really tugs at her heart and Carly puts her all into finding the answers. Nick is determined to show Carly that he is a changed man, and is on her side both professionally and personally. However, there are past hurts and Carly is not sure whom she can trust; will she follow her heart and will that be enough or will it ultimately place her in further danger? Carly and Nick are both characters whom I found myself rooting for throughout the book. They were very "real" and Cantore has done a great job with creating and developing her characters in the series. I found this book to be very easy to read and follow and it kept me wondering and guessing all the way throughout; therefore my attention was held and I wanted to keep on reading! This is an excellent start to the series and a must-read in order series as well! You do not want to miss out on the drama! 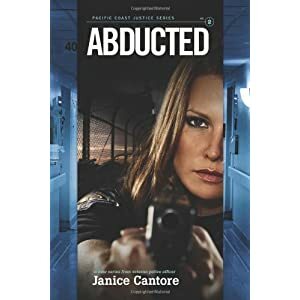 Janice Cantore continues her series with "Abducted," book 2 in her Pacific Coast Justice series. Things are looking up for Carly, she is back to her normal job with her regular partner and she is getting along with her ex-husband. Suddenly, things take a turn for the worse and Carly is thrust back into danger, confusion and questioning her faith. Carly is trying to track down a missing baby and stumbles upon some other discoveries while also dealing with things in her personal life at the same time. The drama and suspense continues in this series! I could not stop reading once I started! Carly is such a well-developed character and she is really tested in her faith in God and yet she does turn to Him and seek Him in the midst of trials. There is a lot going on in this book, many issues are at play all at once, making this a page-turner and a read you will not want to miss out on! I am looking forward to book 3 (and the last) of the series coming out next year - I am looking forward to reading the conclusion of the series and spending one last book with these characters! Book Review - "Raising Financially Confident Kids"
Mary Hunt, founder of Debt-Proof Living, has a new book out there for all parents, "Raising Financially Confident Kids." This book is very thorough, yet very user-friendly and easily read and understood. Money is such a huge part of life, and yet it can easily be consuming and lead to many problems. Hunt stresses the importance of beginning at young ages with teaching about money, the basics of money and handling it wisely. There are tips shared for how to work with kids and teach them different concepts at various ages. This is an excellent resource and really has been thinking about the message that I am already passing onto my children about money even at their young ages. The chapter focusing on debt is filled with great tips and ideas about preconceived notions in regards to birthdays for example. Money can be overwhelming and I do not want it to be something that is to be feared and mishandled, and Hunt's tips will help me with teaching my children the value of money and handling it wisely including giving, saving and spending. A must-read, I highly recommend this to all parents! I read a post on the Reckless Bliss blog (click here to read it!) and I was inspired to create my own list of favorite things! My favorite things change quite daily, so this is my favorite things at this moment! Enjoy! I would love to hear some of your own favorite things! 2. Dunkin Donuts Vanilla Chai. This is one of my favorite drinks and this morning I returned to work after being out for a few weeks and this was sitting on my desk with a note saying "welcome back," I have the best co-worker, what an excellent way to start off the morning and my time back! 3. Pinterest - I recently joined Pinterest and wow, I cannot believe I have been missing out on this for so long! It is so very addicting and I just love looking through various pins and planning out/dreaming about events, parties, recipes, etc....... Wow!!!! 4. Anticipation of Fall. I enjoy summer, just the whole relaxed feel to it, the different schedule, the warm weather, long days.... but I have to admit I am anticipating fall! It is my favorite season to decorate for, I just love the colors, the look, the decor, the scents, fall activities, everything. I have seen fall things in Hobby Lobby, Yankee Candle, and am looking forward to decorating for fall Labor Day weekend! 5. Fresh veggies from the garden. This is truly what makes summer in my book! My parents have amazing gardens and share their vegetables...sooooo delicious! 6. Summer days of sitting out in the sun on a lounge chair watching the kids play and taking pictures. 7. Did I mention pictures? I love taking them, editing them, ordering them, looking through them. I just ordered a ton....had not kept up with them well lately and had months worth to order, so much fun to look through them all and get them put away in albums when they arrived! 9. Catching up on television shows, new favorites (Parenthood), re watching old and beloved ones (7th Heaven, Gilmore Girls)! 10. Making music mixes....something that for sure needs to be done again soon , as there are so many new, catchy stuff out there right now! Little Big Town's "Pontoon" to name one. 12. Cake decorating. I am not so sure that this is my favorite thing while I am actually decorating them....but I love the end result and the kids' excitement over them. Both of my children are summer babies, so we have birthdays recently to celebrate, complete with a Hello Kitty Cake and a Monkey Cake! 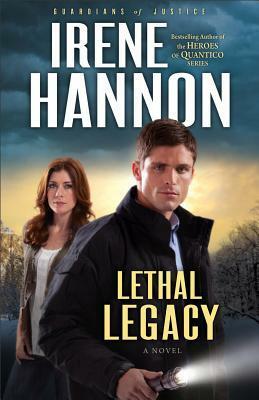 I was excited for Irene Hannon's "Lethal Legacy" to be released as I have loved her Guardians of Justice Series; however I was also sad to see it end as this is the conclusion to the series. Cole Taylor is the main character of this book and the last of the Taylor siblings to be of main focus. Cole works as a police detective and he becomes involved with digging back into a case when a deceased man's daughter has misgivings about her father's death being determined a suicide. Kelly knows that there is more to her father's death than what was determined by the case detective and she will do anything to get this case reopened. However, Kelly does not count of this putting her own life into danger or her heart as she finds herself attracted to Cole and the feelings appear to be mutual. As Kelly works on finding missing information at her father's home, she stumbles upon a photograph that leads to a startling discovery and Kelly learns that her family is not who she thought they were. As more and more discoveries are made, someone becomes even more determined to take care of Kelly and who she believes to be on her side really is not. This is an excellent conclusion to the series! I have enjoyed reading about the Taylor siblings and their relationships and work and this book did not disappoint in the least! Kelly and Cole are both such great main characters and I enjoyed reading and seeing their relationship develop in the midst of the heartache and struggles they face while working on the case. The characters are all so real as are their conversations and interactions. This is especially true between the Taylors and added in to the mix are Mitch and Liz, both of whom are perfect spouses for Alison and Jake. Hannon's style of writing is so easy to read and I just kept wanting to read until I had finished it as it was filled with twists and turns and I could not wait to discover how things ended up! 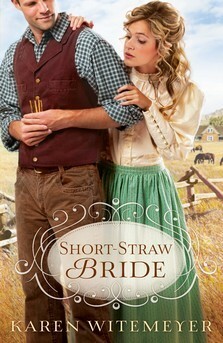 Karen Witemeyer's latest historical romance novel, "Short-Straw Bride," is one of the best books I have read in a long time! I read this book in two sittings, I did not want to stop once I started to read! Meredith remembers her hero Travis whom helps her when she is ten years-old and she often dreams of him, never dreaming that she will have the chance to meet up with him once again. However, life has not gone how she expected as she lost her parents to the fever and has been living the past few years with her aunt, uncle and cousin. Life is soon to change as well though, as Meredith has been offered a marriage proposal; however it is more of a business arrangement and greediness to get her land instead of marrying her for love. When Meredith overhears the man whom hopes to marry her order Travis' barn to be burned, Meredith knows that she must return the favor and help him this time. Meredith is injured while at the ranch with Travis and his three brothers and in order to save her reputation and really keep her from having to marry a man she loathes, Meredith has to marry one of the Archer brothers and Travis draws the short-straw. Meredith has loved Travis for years and she hopes that soon he too will return her love; yet what must Meredith do in order to get him to realize her true feelings and have a marriage with the man of her dreams? This book is so well-written and filled with loveable characters! I love the relationship that the two cousins, Meredith and Cassie have as they are close like sisters and yet there are differences between these two girls as well. The four brothers all have such a strong bond and yet they are each their own individual as well. I would love for this book to be the first of a series about the Archer brothers, I would love to read a book that shares each of their story and read more about all of the characters introduced in this book! There are so many twists in this story and various things going on in the characters' lives that I just kept on turning the pages and soaking up each word not wanting to stop reading until the very end! This is a book you do not want to miss out on it, you will love it! August. Already August. It feels as if the year of 2012 just began and now we are already in the second half of the year. It has been a busy year, when is life not busy though honestly. Tomorrow I will be a mom to a 2 year-old and a 4 year-old, it's hard to believe as both of my babies were just babies and each day they grow up a little bit more. While these past few months have been filled with the unexpected and not exactly gone how I thought they would be, I have been given extra moments to spend wtih the kids and I have been reminded on a daily basis to appreciate the time that we are given and not take these moments for granted.